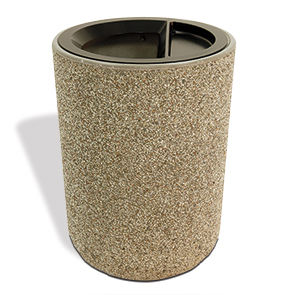 This round 31 gallon model is the most common style of concrete trash receptacle for a reason. It's great for high volume locations because of the two-in-one pitch-in trash top features a generous trash opening along with sand filled snuffer providing safe cigarette disposal. Servicing is simple, the top is easily removed to quickly access the ridged polyethylene liner. Save time, money and resources when you add an Ash/Trash receptacle to building exteriors and outdoor spaces. Providing smokers a place to responsibly dispose of smoking material helps keep spaces free from any unsightly flicked butts. Beautiful standard and premium concrete finishes are available to complement new and existing facility designs.